A beautiful book has just been published by two Chandra mission media specialists. It is available from all the usual online retailers, and would make a wonderful Christmas gift for yourself or others! It features an impressive collection of astronomical photographs, and the two authors have also chosen to blend artwork from Johannes Vermeer, van Gogh, Claude Monet, and a local Victoria artist Henri van Bentum! A beautiful, fascinating, visual exploration of the power and behavior of light across the entire electromagnetic spectrum and how it affects life on Earth and everything in the Universe. A visual exploration of the power and behavior of light, across the entire electromagnetic spectrum, and how it affects life on earth and everything in the Universe. Light illuminates our world and allows us to see everything around us. But, in fact, humans can see only a sliver the full spectrum of light that governs life on Earth and everything in the universe, known as the electromagnetic spectrum. In this highly visual, original exploration, Megan Watzke and Kimberly Arcand present the subject of light as never before. 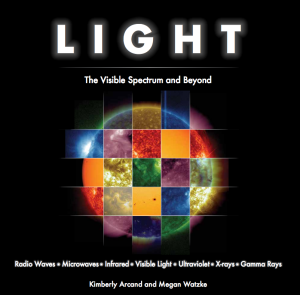 Organized along the order of the electromagnetic spectrum, from radio waves to gamma rays, each chapter focuses on a different type of light, describing its particular properties, characteristics, and practical uses. From radio waves, which allow for TV and cell phone communication, to infrared light which makes thermal body scanning possible, to X-rays, which allow us to peer inside the human body, as well as view black holes and supernovae millions of light years from Earth, Watzke and Arcand show us all the important ways that light impacts life on Earth and beyond. An introductory chapter gives an overview of the electromagnetic spectrum and describes what light is and how it behaves, while hundreds of full-color photographs and illustrations demonstrate concepts and make for a stunning book that’s a joy to read and browse through. Light is the perfect book for readers of all ages and anyone interested in the beauty of science of our visual world. More details from the authors’ website.